Insulating material of high thermal resistance and high mechanical strength. Produced from expanded polystyrene adding graphite. Used in interior and exterior thermal insulation systems for buildings (including the Thermoseal System). Suitable for areas requiring extra protection (enhanced waterproofing zone of the Thermoseal system). 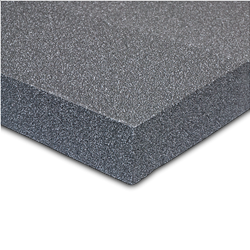 Advantageous over conventional EPS due to its water repellency, low moisture absorption, but mainly because its energy efficiency offers up to 20% better thermal insulation performance than conventional EPS. Dimensionally stable.